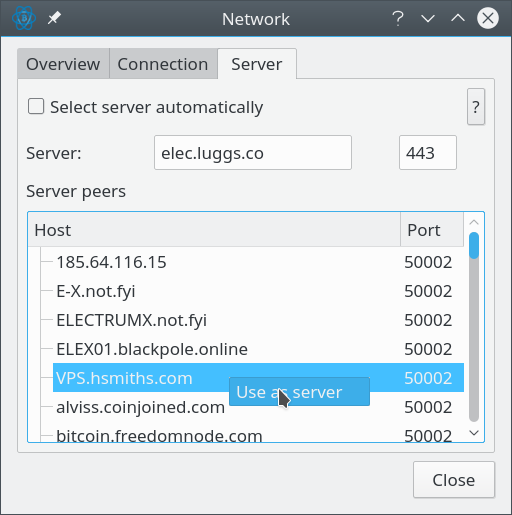 Electrum uses Electrum servers to interact with the bitcoin network. It uses them to find out which transactions are relevant to your wallet and also to broadcast spending transactions. The server you are connected to will see your addresses, transaction history and balances. It will not get access to your seed or your private keys. The orb icon in the bottom right of the Electrum window is red instead of green or blue. Red means Electrum is not connected to a server. Green means it is. Blue means it is connected to a server via a proxy. The orb changes to arrows when you are synchronizing with a server. Your transaction history and balances are not updating like they should. Click on close and then pay attention to the status bar. Electrum will sync with the new server you selected and hopefully start working properly. If it doesn’t then repeat the process with a different server.